Hi all, I'm back from a lovely holiday in Scotland and first of all I need to say 'Thank you' to all of you who visited my page last week and made some lovely comments, knowing full well that I would be unlikely to make return visits. I did say internet access might be rubbish in Scotland and I was right. I wrote the post before we left home on Monday and published it on Tuesday evening in the pub where we had supper. Then Wednesday morning saw me standing outside the pub hoping I could log back into their internet to upload to The Lady Julia's Stamping ground. It seemed to take ages, and then it started to rain, but I checked it was successful then dashed back to the caravan for breakfast and that was the last time I had any internet access. So my desk this morning, or actually last night before I went out. You can see the few bits of crafting materials and tools I took away with me. There is my Spellbinders Sapphire, a storage folder of dies, my Pan Pastels, some cotton wool, craft knife and craft mat. I didn't actually use them in the caravan but one of the friends we went to see took me to her local craft club and I did a little bit of playing with the Pan Pastels. Unfortunately I discovered that the Sapphire doesn't take embossing folders very satisfactorily so spent ages trying to sort the sandwich which left very little time to do much with the pastels. 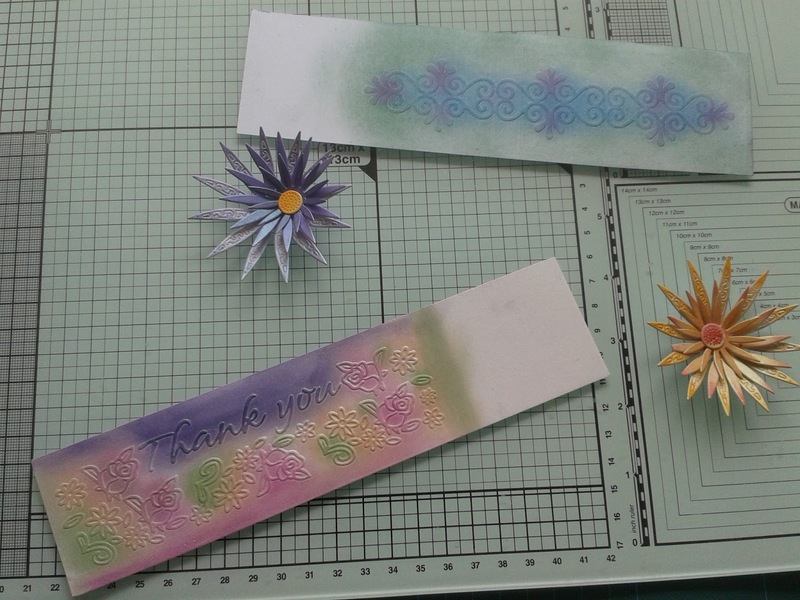 This is what I did manage to do, the one bit of embossing that was vaguely satisfactory, it says Thank you, and then I cut out some flowers and coloured them with the pastels. 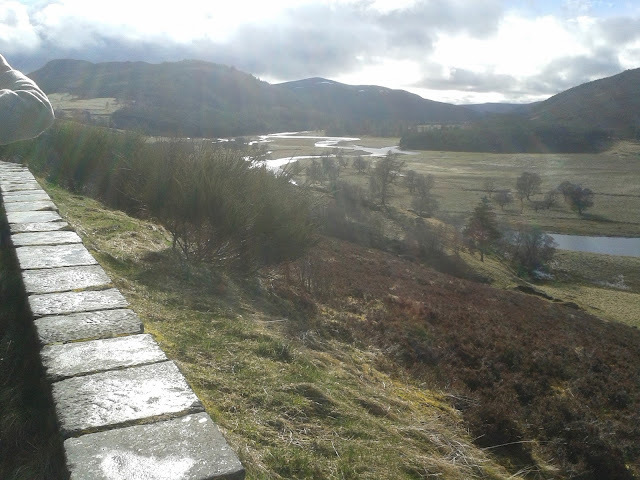 And just to prove I went to Scotland, this is the river Dee near Braemar, looks a nice well behaved river there, but in December it escaped its bed in Ballater, where our friend lives, and caused the worst flooding in living memory. She wasn't flooded, but she was very busy helping all those who were. 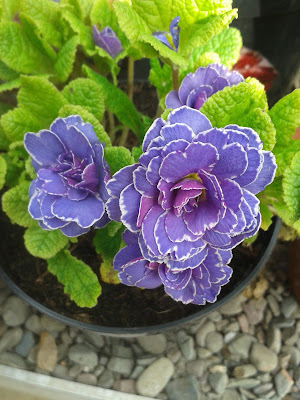 I'll leave you with this lovely picture of a Miss Indigo primula that we saw at Thrieve gardens, near Castle Douglas. So bright and cheerful on a chilly spring day, and the gardens are really worth a visit if you are in that area. Apart from sorting the inevitable pile of washing we brought back from the trip, I have nothing to do today, so will definitely return visits and do lots of desk visiting as I missed seeing all your desks last week. Glad you had a nice holiday - what a picturesque place it looks. I love the little spiky flowers you made, they remind me of sea holly - were they cut from a die? Ah have been to that part of Scotland Chris and even went to Balmoral which is at Braemar, saw the river Dee walked over it etc.. lovely part of a beautiful place..
well done on linking up while away, too and the use of some crafty goodies! Glad you had a great trip! Pretty embossing. Sounds like you had a lovely trip. Sometimes it's great to be without the internet! There's a place hubby and I go on holiday where our phones don't work. The hotel does have internet so can keep in touch that way but when we're out and about we can't get in touch with people and it is kind of nice. 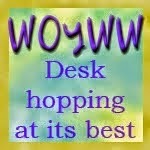 Nobody can bug hubby or (when I was working) me either and it was so nice not to get work calls/emails. I like the colours on your embossing - so pretty. Glad to hear you ahd a great holiday. That primula is just the most beautiful colour I have ever seen. I wish I could colour like that! I'm sure you had a wonderful time in Scotland with all of it's beauty! I'm glad you had a nice holiday, and without need for Internet till Wednesday! That kind of goes above and beyond!! I think the pastels look lovely on the flowers, I like the opacity over the embossed text but they look fiddly. I must be wrong though, so many people have them! Glad you had a nice trip to Scotland. We have been a few times but have never really been fortunate with the weather and the one time it was nice, we were pestered by midges and only stayed one night as my DH is allergic to anything that bites. I haven't got a Sapphire so can't advise you on that. The Pan Pastels look lovely. I love the subtle colours. I have looked at them on the internet and seeing the price, I think I'll stick to water colours. 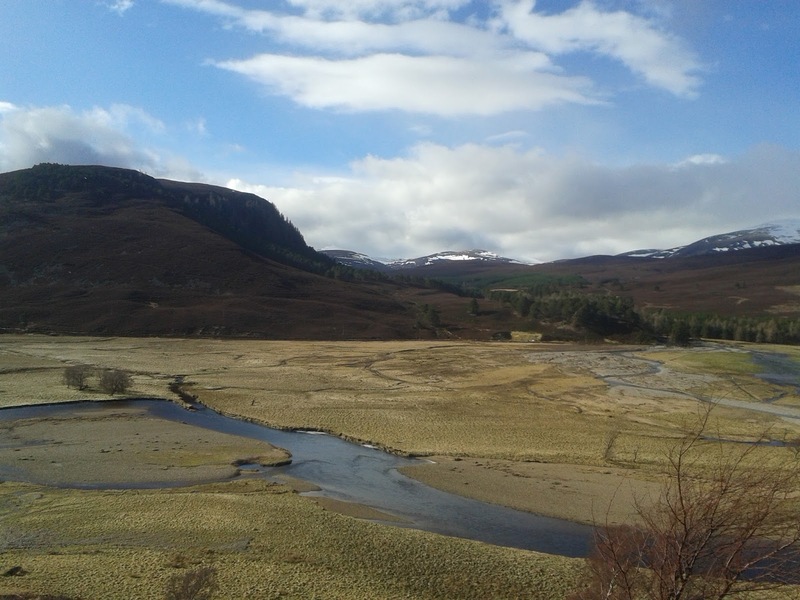 Lovely photos, Chris, and I'm glad you had a good holiday in Scotland (despite poor Internet access!). I love Scotland - my grandmother was a Highland Scot and we always had summer holidays up there. 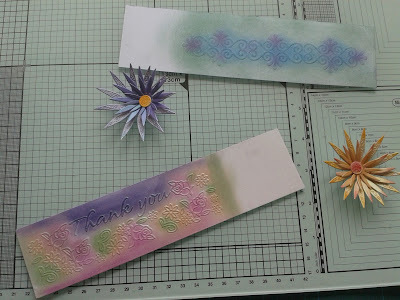 I love your embossing with the pan pastels - not a combination I've ever thought of trying! It's really pretty, and your flowers are beautiful - so delicate. Thank you for your lovely comment - it made me smile! You will be glad to hear that once I'd changed the faulty switch on the uplighter, and replaced the halogen bulb in the fibre-optic lamp, I was able to say, "Let there be light!" "...and there was light" haha! (Not that I created it out of nothing, though, lol!) Praise God! 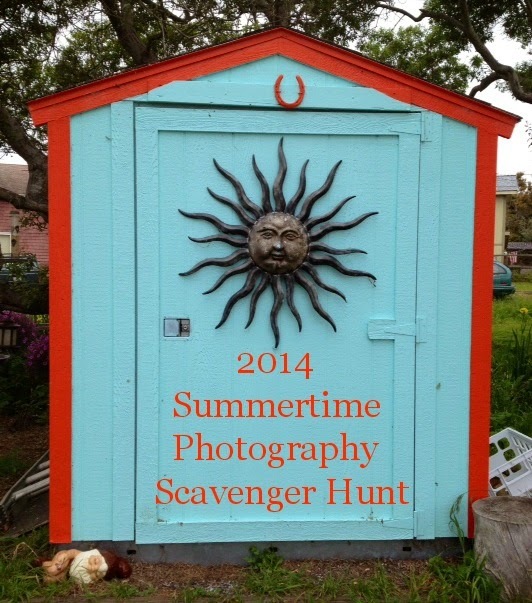 If you hop back to my blog you can see the (long!) 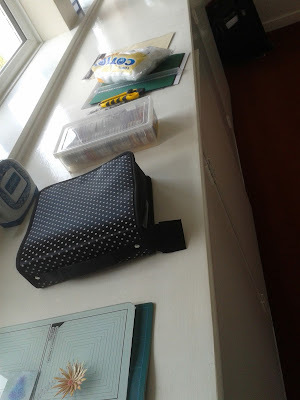 post I uploaded last night, with all the photos of the room and its transformation. We are so thrilled with it. Thank you for your lovely comment on my blog post about our newly-decorated sitting room, Chris. So glad you like it! We are thrilled with it, and I agree about the orange stencilling softening it. The room feels bright and sunny now.